Falkirk is an overlooked jewel in the centre of Scotland. Lacking the strut of Edinburgh with its castle, festival and tattoo and the sheer brash vibrancy of Glasgow, Falkirk is an understated testament to both ordinary lives and extraordinary events. It is a place and a way: it rests at the edge of the Forth on the Antonine Wall, the Roman frontier between North and South, between Empire and Barbarians. Falkirk stands at the centre of Scotland. Historically it has connected Edinburgh in the east and Glasgow in the west and Stirling, the gateway to the Highlands and the North East fringe to the North. With the mass of the Braes and Southern Uplands to the south, the Forth to the east and the Highlands to the north it has seen and been part of historic events throughout the ages. The Antonine Wall was at one time the northern frontier of the Roman Empire. It created both a barrier, the Antonine Wall and also a road behind it running between east and west coasts, between the Clyde and the Forth. That road, and the road that extended north to the barrier of the Highland line were and are the go to land routes, the east-west road behind the wall and the north south military road that reached beyond Stirling continued in use for centuries after the Legions left. The canals, the Forth and Clyde and, later, the Union Canal were at the centre of the industrial revolution, the revolution that changed the life of people in Scotland for ever. It was initially through the canals that industry thrived, driven by coal and iron: the canals created a highway that providing viable routes between the two great competing cities of Scotland. The flatlands and kerses by the Forth and through the Forth and Clyde Valley meant that the railways when they came ran through Falkirk, where railways met and dispersed. More recently the motorway system that loops around Falkirk has become the a mirror of and replacement for the railway system set up by the Victorians. Falkirk is now a place passed around, drawing in visitors mostly passing through on the road to somewhere else, attracting coaches calling in to eat and souvenir at the Kelpies or at the Wheel. And, now of course, there is The John Muir Way, the latest line drawn across Scotland, often following the older ways. Especially in, through and around Falkirk. Falkirk’s history is a history of Scotland. The frontier of the civilised world running from Bo’ness in the east and Old Kirkpatrick in the west. A celebration of Falkirk and Scotland as a place of work symbolised by water horses with the heads of Clydesdales, the archetypical Scottish working horse. The Kelpies stand guard over the end of the Forth and Clyde Canal, which ends in Grangemouth, the town that was created by the building of the Canal. The Wheel from the New Tunnel, joining the Union Canal to the Wheel itself. And the Kelpies. In 142 AD, the Romans moved the frontier north from Hadrian’s Wall and built the Antonine Wall for the new Emperor Antoninus to further the reach of Rome. 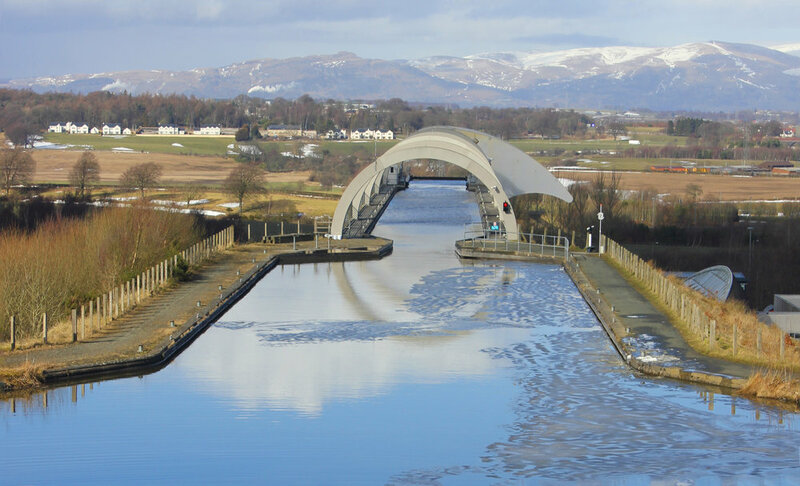 The Wheel celebrates the Millenium, reconnecting the Forth and Clyde Canal with the Union Canal making a canal journey between Glasgow and Edinburgh possible once again.